Great fall fishing was the hallmark of this past month. The weather improved, the water is clearing, and the fish are extremely hungry. 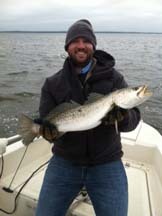 Inshore waters are now a reasonable temperature for larger trout to move close to shore, staging for the winter bite….moving into rivers and creeks. I fished near the end of the month for only an hour and a half and caught 8 trout, all over 22 inches, within 300 yards of the shoreline. Redfish are still scattered but some are schooling and preparing for their departure from the shallows to spawn offshore. 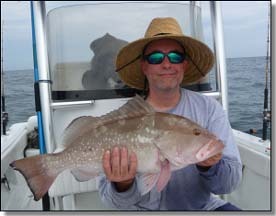 This is the time of year when these large reds, up to 30 inches in length, can be caught in shallower water, as well as offshore where they cause mayhem among offshore fishermen expecting grouper, kingfish or sea bass. We’ve seen great numbers of large trout (both speckled and sand varieties), redfish, kingfish, red grouper, and lots of sea bass and Florida snapper. Below are a number of pictures from our customers this month. 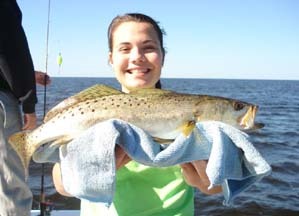 Inshore, Smoak Allen and best bud Sarah Connelly had a great month, with lots of fine reds and trout fishing both north and south of the river. 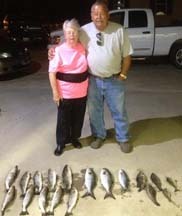 Courtney Monson shows off a fine keeper trout caught on a cork rig, and Betty and Buddy Welch caught this fine mixed bag on live shrimp from the Ship’s Store. 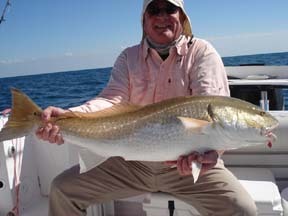 Nearshore, there were a lot of giant bull reds taken. Bob Sargent and Richard Wright scored these beauties, while Rob McRae landed this fine 25 inch trout and Ron Parson brought this Spanish to the tables. 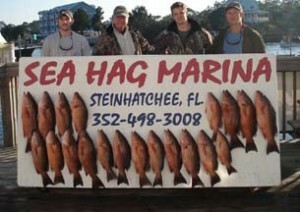 Offshore, Brad Carini and Mike Moore hit paydirt with these fine kingfish, Randy Marcum found some great red grouper fillets, and the last picture shows something unusual: an entire board full of mangrove snapper. Fishing with Sea Hag pinfish, Eric and Chris Selle, Hunter Carter and Rusty Pike found these mangos in 100 feet of water. 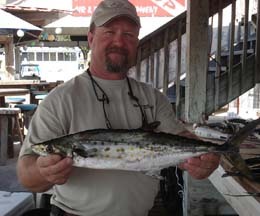 Offshore, red grouper, kingfish, and great bottom fishing for black sea bass and Florida snapper will keep you busy and provide some great eating. This time of year, bottom fishing is the ticket, with some live pinfish from the tanks at the Ship’s Store, or frozen bait, especially cigar minnows or squid. Fish structure and areas of hard bottom and use your bottom finder to locate fish. 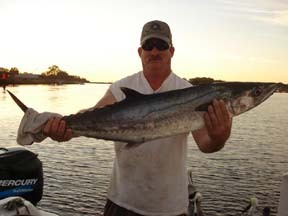 For some great fun, fish popular structure (such as local springs such as Lamb Spring) with live bait for amberjack. Offshore fishing in December is frequently overlooked because of temperatures, but you can catch some excellent fish this time of year. Inshore, look for schools of bull reds as they are schooling prior to migrating offshore. Look for schools in 3 feet or less of water, and approach very quietly. A lot of excellent redfish have been caught this month on live shrimp or cut pinfish fillets and those tactics will continue to work well through the winter. 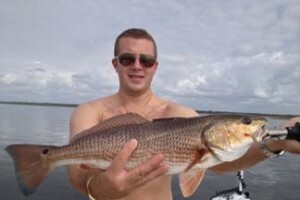 With continued temp drops, the remaining redfish will move into creeks and collect in deeper holes. 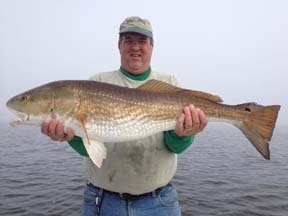 Airboat fishing for redfish in the winter is a great way to catch large numbers of reds in these creeks. Trout are still plentiful on the flats, and as the temperatures decrease, they will move closer to shore to feed, especially as long as water temps rise in the afternoons. When the water fails to get over approximately 55 degrees during the day, trout will move toward deeper water because it’s warmer, and they have two options. They can move offshore into 10 foot depths or more, or they can move into the river. I’ve already seen a number of fish taken in the river, but colder temps will bring about the madness known as Steinhatchee River trout fishing. You can easily find out the current status of river fishing by calling the marina; we’ll let you know what’s going on. One of the most crucial aspects of fishing inshore in cold water is to decrease the rate of retrieve of whatever you are fishing. In shallow water, drifting live shrimp under corks or fishing suspending lures such as the Mirrolure Paul Brown lures (known affectionately as Corkys), Rapala SSW lures, slow-sinking artificial shrimp such as the DOA 3 oz. 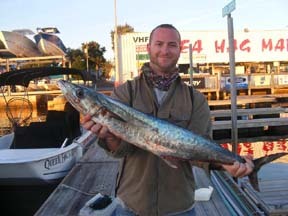 shrimp or soft plastic Sebile lures will provide you with some great fishing. When fishing the river, the standard is the 52M Mirrolure series, thrown upcurrent and worked back very slowly as it sinks. Many experienced river fisherfolk troll these lures slowly down the channel to locate fish. Using a good bottom machine can help, but in the winter the river is full of lots of fish that aren’t trout (like mullet and croaker, for example). However the vast majority of river trout are taken on a simple live shrimp rig with a few splitshot to get the shrimp down into the current. Because most of the river bottom is rocky, bottom fishing with heavier sinkers is challenging and you will lose some rigs. The river gets crazy when the trout run is on; please be careful to keep your boat out of the channel. When fish are located, anchor outside the channel and cast into it. As the water warms in the afternoons, sometimes the fish will move into the shallower areas of the river. And if the bite slows, be patient, because trout come through the river in schools, and it’s likely another school will be motoring by soon.